The Scribbler. A comicbook movie based on a 2006 Image Comics graphic novel – both of which is “new to me” as of today’s post. How has any mention of this escaped my obsessive comicbook news crawl?! Nothing on Twitter either that I can recall. The only reason I “stumbled” across the image below was because I was compiling images for my Superman #1 Cover Homage post and I happened to type in Scribblenauts – which eventually lead to the poster in the results. Both the OGN that the movie is based on and the creator Dan Schaffer are also “new to me”. Sure, there’s no way I could know of every comic that has ever been published, but for one of those comics to be turned into a movie (low-budget as it is) and not get some attention is baffling. Especially considering the recent “Where are the female-led comicbook movies?” outcry that has been making the rounds. Turns out, like all things, what people are really asking is: “Where are all the DC/Marvel female-led comicbook movies?”. You know, because everything else doesn’t count. Right. (More on that tomorrow). Anyway, below is the blurb and the poster. Lead actress Katie Cassidy is a regular on Arrow (still haven’t dug into that series… yet). And it stars a few actors that have comicbook/geek media connections: Garret Dillahunt (Terminator: the Sarah Connor Chronicles, Looper, Alphas), Michelle Trachtenberg (Buffy), Gina Gershon (Catwoman on the Batman), Kunal Nayyar (Big Bang Theory) and Billy Campbell (the Rocketeer!). And while it doesn’t necessarily look like a great movie, it has the makings so far to (hopefully) be an interesting watch. At the very least. And, hey! 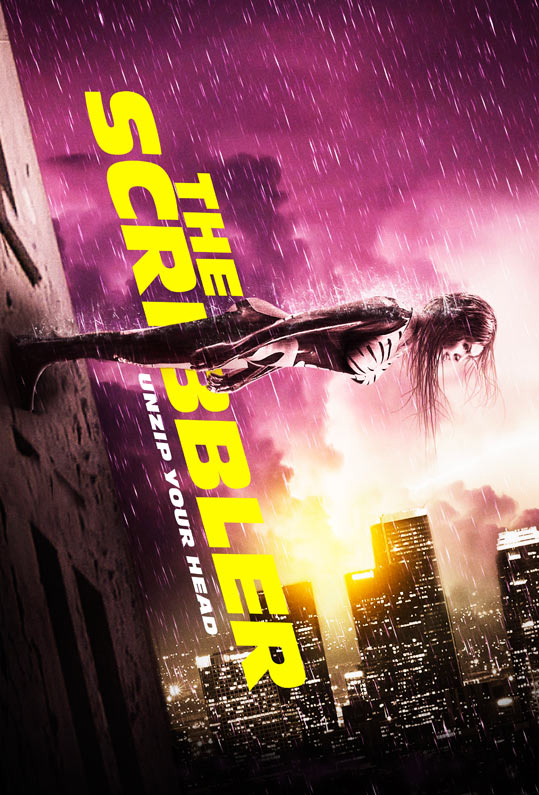 The next time someone tries to do the tired, old DC vs Marvel dance trying to determine which one will be the first to make a female-led comicbook movie in this decade’s super-hero movie zietgeist, tell that person to take off the blinders and meet … the SCRIBBLER! Anyway. As usual, all that you write above gets to the heart of the matter about what people “want.” it is perplexing there wasn’t much hype on the comic sites, but I’ve drifted so far away from then, I wouldn’t have known anyway. I did catch some posts from Schaffer on Facebook, but other than that, it’s been quiet. Didn’t realize Garret Dillahunt was in it (I’ll check out most anything he’s in, after his turn as two characters on Deadwood), and I’m always up for seeing what the Rocketeer is doing. Thanks for sharing that bit of info.